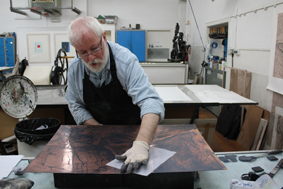 There are 5 major Print Studios of Scotland who each work directly with artists to produce original artworks that are exhibited internationally. The studios are Peacock Visual Arts (Aberdeen), Dundee Contemporary Arts, Edinburgh Printmakers, Highland Print Studio (Inverness) and Glasgow Print Studio. Occasionally these partners come together to work on collective projects under the banner of the ‘Scottish Print Network’. The Scottish Print Network has just launched Below another sky: an international residency programme to support new work in print by artists from Scotland and Commonwealth countries. 10 artists from Scotland and 10 from Commonwealth countries have been invited to undertake residencies during 2013 and 2014. Artists from Scotland are travelling to Antigua, Canada, India, Malawi and New Zealand; artists from Australia, Canada, India and Pakistan will be on residency in Aberdeen, Edinburgh, Glasgow and Inverness. The participating artists include Claire Barclay, Christine Borland, Geoffrey Farmer, Emily Floyd, Janice Kerbel, David Noonan and David Shrigley. If you are interested in visiting one of these venues, four coach trips have been arranged for delegates on Sunday 1st September. For more information about times and itinerary please click here. With kind sponsorship form anCnoc, ‘Artists In Print: 21 Years of Collaboration’ is an exhibition celebrating 21 years of printmaker Michael Waight’s collaboration with a wide variety of artists at Peacock Visual Arts, Aberdeen. Work by local, national and international artists, all produced at Peacock Visual Arts over the years will be presented side-by-side for the first time. An eclectic mix of styles and techniques will be on show, from simple beginning-of-career relief prints, to the most complex and beautiful copper etchings. A gallery walk-around and informal talk with Michael will also be held at the gallery, to coincide with Impact8 Conference and the Scottish Print Festival. Preview 01 August 2013, 7-9pm, all welcome! This solo exhibition by Glasgow based artist Rachel Maclean premieres film and screenprints, commissioned and published by Edinburgh Printmakers over the last two years. Producing work that slips inside and outside of history, Maclean explores Scotland’s romantic past through the lens of contemporary political debate. Employing a monstrously alluring aesthetic, the work explores a hybrid of styles that reference the rugged romance of Scottish Landscape painting, the all-smiling, futurist visions of SNP propaganda and the hyper-saturated pop colours of ‘Oor Wullie’. 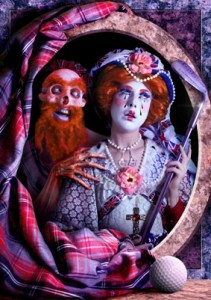 Maclean is the only actor or model in the work, using costume and face paint to invent characters that drink North-sea oil from Jacobite crystal, divide up pieces of a Union Jack cake and incite conflict over the mispronunciation of Robert Burns poetry. At once violently positive and grotesquely kitsch, this exhibition employs dark humour to create a complex and surreal vision of contemporary Scottish and British national identity. Three generations of leading Scottish artists will be represented in one landmark exhibition at Glasgow Print Studio (GPS) this summer. Turner prize-winners will exhibit alongside members of the Royal Scottish Academy and mid-career artists. The exhibition, which opens on 23rd of August 2013, is entitled 40/40: forty years, forty artists and celebrates the 40th anniversary of the studio. It will feature specially commissioned, new work from 40 GPS members and collaborators, including Alasdair Gray, Elizabeth Blackadder, Martin Boyce, John Byrne, Jim Lambie and Toby Paterson.